A brunch recipe on a Monday, you ask? Why, yes! Things are a little bit backwards here this week after lots of stormy weather, 2 days of power outages, and of course, no internet. It was an unintended digital detox weekend without lights, TV, or blogging. I read an entire book from start to finish, we got out of the house for most of the weekend, and indulged in lots of dining out and take-out. As power-outages go, this one was chilly but survivable. Now that we’re back in action (hallelujah for heat and WiFi! ), I have a tasty brunch recipe that can finally be shared! On a mission to eat healthier this year, I’ve been tackling a lot of our favorite dinner recipes to give them a better-for-you spin (like my Brussels sprout pasta, cauliflower stuffed peppers, and one-pan shrimp and veggies). 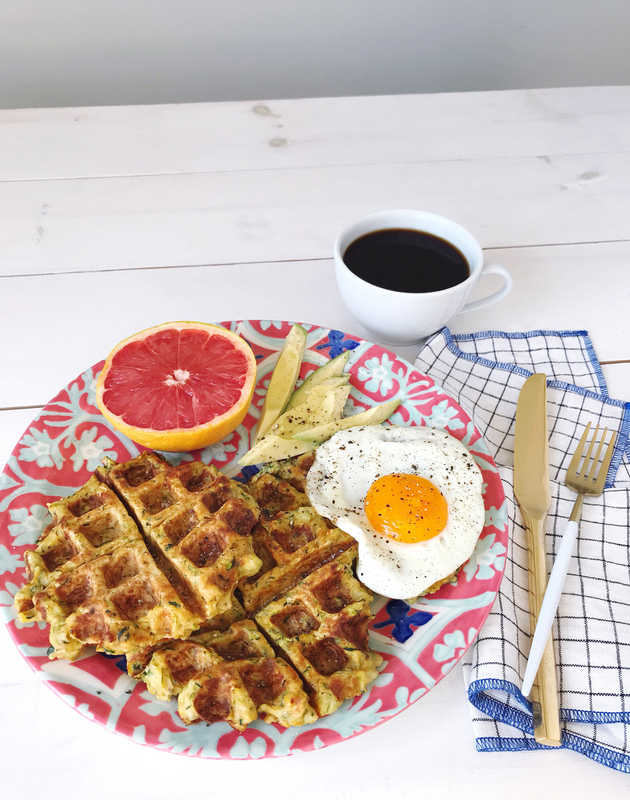 With some dinner options down, I’m turning my attention to brunch today with a crispy, flavorful waffle made out of zucchini! 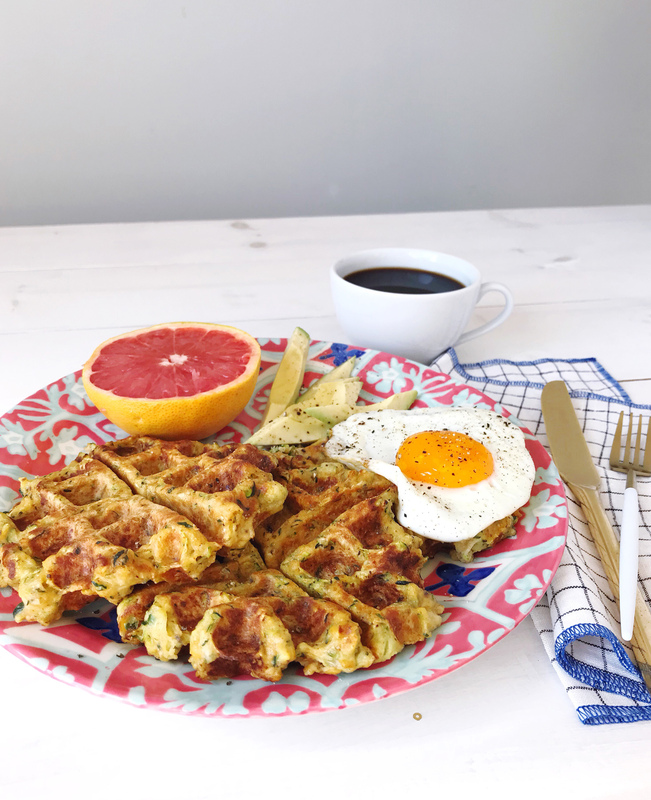 There is still a little bit of flour in these waffles, but with several cups of shredded zucchini in the recipe, they’re packed with veggies and a healthier take on this fluffy breakfast treat. 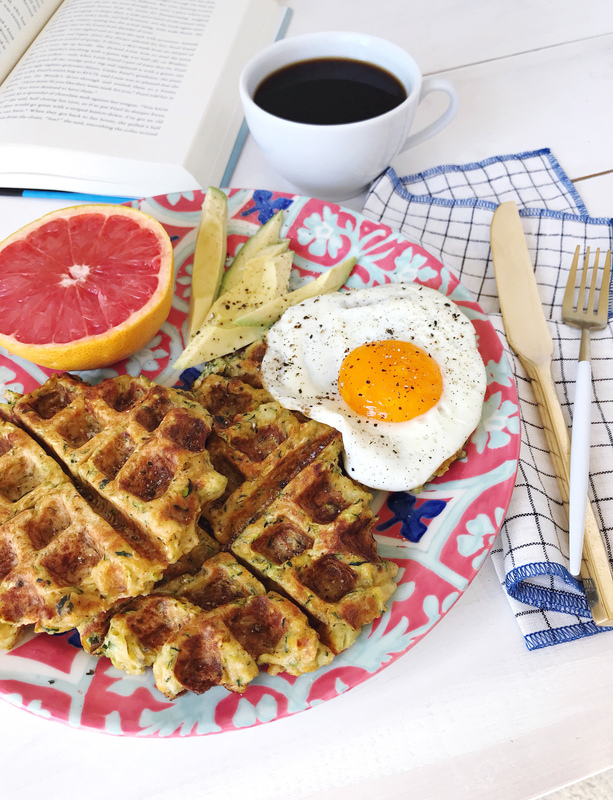 The best part of this recipe is that it solves a long-time brunch dilemma of mine: I’m constantly torn between the savory brunch dishes and a sweet stack of waffles. This way, I get the waffles packed with savory flavors that pair perfectly with a fried egg, some sliced avocados, and a hot cup of coffee. Get the full recipe below! Use a box grater to shred the zucchini into a large bowl, until you have about 5 cups. Salt the zucchini and let it sit for 5 minutes to draw out excess moisture, then use paper towels to pat the zucchini dry and absorb as much liquid as you can. Whisk together eggs, parmesan cheese, and spices, and then pour the egg mixture over the shredded zucchini. Toss the ingredients to combine, fold in the flour, and season with salt and pepper. Preheat your waffle iron, and generously coat it with non-stick cooking spray. Add ⅙ of the batter (about 1 cup) of the waffle mix to the iron, close and let it cook. Cook for 5-6 minutes on the waffle iron, until the color is a golden brown and the waffle looks just crisped and holds together firmly. Remove the waffle from the iron, and repeat with the remaining batter. Serve the waffles immediately with additional salt and pepper, a fried egg, and avocado slices on the side. Coffee and Donuts. Pantry and Prop Closet Organization.